APA Groups securities touched an all time high of $5.47 on 22 November. This was despite APA having recently issued 21.3 million new securities as part of the consideration for the takeover of Hastings Diversified Utilities Fund. APA also issued £350 million ($536 million) of 12 year Medium Term Notes (MTNs) from its European MTN program. The proceeds will be used largely to help repay about $1.4 billion of Hastings Diversified Utilities Fund short term bank debt. The MTNs have a fixed annual Sterling based coupon of 4.25 per cent per annum and mature on 26 November 2024. The principal and interest obligations have been hedged into A$ obligations with quarterly A$ payments at an average fixed rate of 7.36 per cent per annum. DUETs security holders have voted to internalize the funds management, which is expected to be implemented on 4 December. Chairman John Roberts said internalization should more than halve annual corporate operating costs, will eliminate management fees and de couple DUETs corporate costs from the performance of its security price, eliminate potential future performance fees, enhance the Groups governance, strengthen the alignment of interests of the board and management with those of securityholders, and potentially broaden the investor base. Commonwealth Bank and its subsidiaries have increased their interest in Sims Metal Management from 7.13 to 8.52 per cent. Standard & Poor's has revised its outlook for Envestras BBB credit rating from Stable to Positive. He said it reflects recognition by Standard & Poor's of Envestra's prudent financial strategies over the past several years that have and are expected to continue to result in lower gearing, higher coverage ratios, stronger covenant protection for financiers and more favourable borrowing costs. The Climate Advocacy Fund will broaden its mandate to non climate related issues, said managing director of Australian Ethical Investment, Phil Vernon. The fund will also change the way it advocates, and will dismantle the nominee structure which is uses to put resolutions to companies on issues of concern but which is complex and expensive. The investment structure will also change from an index fund to an ethically screened fund. This fund will buy stocks in companies with which we wish to advocate against but will only remain invested whilst the engagement is active, said Mr Vernon. With the finalization of its strategic review, Aspen Group, which manages the Aspen Parks Property Fund, has confirmed that it will now focus on its core strengths - its on balance sheet investment property assets and the management of the Aspen Parks Property Fund including the growth of the Fund. It will use these core assets to drive security holder value and has appointed UBS AG, Australia Branch as financial adviser. Aspen Group has implemented a divestment program to exit non core assets and businesses and will also exit property development. Shares in CBD Energy continue to trend down and touched an all time low of 1.6 cents on 22 November. CO2 Group has had its Carbon Farming Initiative (CFI) methodology, Reforestation and Afforestation, endorsed by the Domestic Offsets Integrity Committee (DOIC), making it the first endorsement for a methodology developed by a proponent other than the Department of Climate Change & Energy Efficiency. The achievement comes after 18 months of expert review, and allows CO2 Group and its clients to participate in the Carbon Farming Initiative and start to generate Australian Carbon Credit Units (ACCUs) from their large carbon forest holdings that hold carbon sequestered from 1 July 2010. ACCUs can be used to manage emissions liabilities under the Australian Carbon Pricing Mechanism (ACPM). Chief executive, Andrew Grant, said This endorsement represents a very clear validation of the strength of our carbon accounting systems, the depth of our technical team and our ability to deliver fungible carbon credits from the range of carbon investments we develop and manage. We can expect to see the volume of forest carbon projects registered under the CFI and the amount of realized forest derived ACCUs increasing considerably over the next 6 to 12 months, Mr Grant said. Shares in Energy Developments reached a new two year high of $3.14 on 22 November. Under its share buyback, the company can buy shares at up to $3.26. The company is on schedule to deliver the 13 MW German Creek power station expansion with commercial operations forecast to commence in January, Construction has commenced on the McArthur River 53MW expansion. In August the company commissioned the Hill 60 15 MW remote energy project. Former Environmental Group chairman John Read has retired as a director. Mr Read was appointed in March 2001 and was chairman from April 2001 until August 2012. Shares in Aeris Environmental jumped from 15 cents to 22 cents in the week to 23 November. The company held its AGM on 15 November. Cell Aquaculture has appointed voluntary administrators. Straits Consultancy Pte Ltd advised that it will not invest further funds into Cell Aquaculture; and the board of Cell Aquaculture said it formed the opinion that Cell Aquaculture is likely to become insolvent in the near future. Christopher Williamson and David Hurt have been appointed joint and several voluntary administrators of the company. 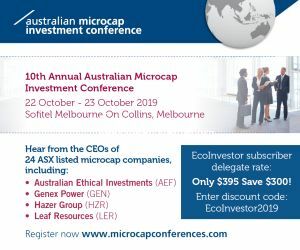 Shareholder unrest seems to be at play at Pacific Environment where the company has received a notice for an extraordinary general meeting to vote on removing Murray d'Almeida and Adam Gallagher as directors and appointing Marc Wilson and Terrence Butler as directors. Phoslock Europe anticipates sales will increase considerably over the next six months, said chairman Laurence Freedman. In Asia we have been approached in both Korea and Malaysia for initial treatment of private aquaculture farms, which we expect to become more sizeable contracts once the initial applications are successful. This will further enhance Phoslocks footprint across Asia and help consolidate our relevance to the aquaculture industry, he told shareholders. The company also expects a major increase in sales in the US as a result of receiving North American Drinking Water certification. Liquefied Natural Gas will not make a takeover offer for WestSide Corporation, but another unnamed company has made an indicative takeover proposal of 52 cents per share. WestSide has advised shareholders to take no action at this time, as the potential acquirer has requested more time to finalize due diligence on additional information and it is uncertain whether it will make any acceptable binding proposal. WestSide said the proposal is for all of the company but is conditional, non binding and confidential. Executive chairman Angus Karoll told the companys AGM that gas production during the second half of the financial year achieved an impressive upward trend. This reflected the success of our well work over programs and rising contribution from new wells which accounted for approximately 35 per cent of gas sales at the end of the period. Shares in Lynas Corporation touched a two year low of 55.5 cents on 16 November. One reason many be that Mitsubishi UFJ Financial Group is no longer a substantial shareholder. Lynas said about 100 containers of rare earths concentrate arrived in Kuantan in Malaysia, and a significant portion are now at the Lynas Advanced Materials Plant (LAMP). Lynas expects that first feed to kiln and commencement of operations at the LAMP will occur over the coming days. Executive chairman, Nicholas Curtis told the annual general meeting It has been a very long journey to this point, but one which has now reached a critical milestone first production. Something I, for one, amongst all shareholders, have been dreaming about for many years. I know this has been a testing year for everyone. I acknowledge that on the metric of the value of the shares on the Australian Securities Exchange it has been a very bad year, and in particular a surprisingly bad week. The market value of the company remains significantly lower than last year. We have faced a range of uncertainties and challenges, of which you would no doubt be aware. We have also been subject to intense scrutiny and speculation around the future of the company. It has been a year when the noise around the company has reached an amplitude that is, quite frankly, not sustainable and very negative for us all. But he said We have now built the worlds biggest and most advanced Rare Earths plant, and we are ready to deliver on our vision of being the global leader in Rare Earths for a sustainable future. Shares in Dart Energy fell to an all time low of 12 cents on 19 November. Dart Energy said the upcoming IPO of its subsidiary, Dart Energy International Ltd (DEI) the AIM market of the London Stock Exchange has been delayed for a short period while it evaluates a strategic proposal from an industry player. Dart said all preparatory work for the IPO has been completed. Marketing to institutions and investors began in October with a view to completing the IPO by the end of November. Despite the difficult equity market conditions, over 100 parties have met with DEI senior management in the UK, Europe and Asia. This led to oil and gas participant in Asia proposing a strategic relationship with DEI including a material participation in the IPO. Dart said the transaction could achieve long term strategic, operational and financial benefits for DEI, especially in Asia, and will strengthen the IPO. Galaxy Resources directors Yuewen Zheng and Xiaojian Ren have sold 256,704 shares at an average price of 49.6 cents each. Each director is also a director and shareholder in Creat Group Company Limited which has a legal or beneficial interest in 52.95 per cent of Creat Resources Holdings Limited. They said the company needs working capital and the disposal is to raise short term funding so the company can continue its operations. The board said the companys investment strategy regarding Galaxy is unchanged and the disposal is only a small portion of its holding in Galaxy. Orocobre has commenced construction at its Olaroz Lithium Project in northwest Argentina, with completion of the US$229 million project expected in early 2014. Orocobre said it will be the worlds first largescale, low cost greenfield brine lithium operation to have been built in nearly 20 years. First phase production will be 17,500 tonnes per annum of battery grade lithium carbonate. Orocobre has been named "Mining Company of the Year 2012" by Argentine mining magazine Panorama Minero and Fundacion Para el Desarrollo de le Mineria Argentina (Foundation for Development of Argentina Mining). Actinogen received a query from the ASX about its low cash level and whether it can fund its operations. Shares in BluGlass leapt to a new three year high of 37 cents on 23 November. A day earlier the company announced that it had reached a proof of concept milestone by producing n-type gallium nitride films (GaN) with industry equivalent electrical properties using its Remote Plasma Chemical Vapour Deposition (RPCVD) technology, and that this has been independently verified. BluGlass said it can now grow n-GaN films with low impurities and electrical properties equivalent to films grown using the industry standard MOCVD process, but at much lower temperatures. The next stage is to commence experiments to improve GaN layers with the aim to improve the efficiency of LED devices over those produced by MOCVD devices. Chief executive, Giles Bourne, said This is a pivotal moment for the company that has significantly de-risked the technology. The suspension of Earth Heat Resources shares has been extended while the company seeks to change its business focus. The company is to broaden its exposure to energy projects and As a consequence the exposure to geothermal projects is likely to be reduced over the next 12 months, it said. EnviroMission and the Southern California Public Power Authority (SCPPA) have ceased negotiations about a Power Purchase Agreement (PPA) for power off take from EnviroMissions proposed La Paz Solar Tower development in Arizona. The change in the PPA with SCPPA, first announced in November 2010, is due to recent changes by the State of California to the Renewable Portfolio Standards of energy generators, which placed pressure on SCPPA members to provide certainty of delivery of their Power Purchase Agreements, said EnviroMission. EnviroMission could not realistically meet the SCPPA timetable created as a result of the pressure placed on SCPPA members by the California RPS mandate, said EnviroMission chief executive, Roger Davey. EnviroMission and its partners in the project remain totally committed to the delivery of the project and are continuing with development as planned, he said. Geodynamics is to acquire an interest in the Savo Island Geothermal Power Project in the Solomon Islands, and has completed the second open flow test at Habanero 4. The company said the second open flow test achieved increased flow rates and significantly higher flowing pressures than the first test. It highlighted that local stimulation enhanced the wells productivity by improving the connection between the well and the fracture zone. Major stimulation has now been commenced to extend and enhance the known fracture zone. Early results exceed those of Habanero 3. The Savo Island Geothermal Power Project is a conventional geothermal power supply project. The deal is a two stage earn in and joint operating agreement with Kentor Energy Pty Ltd, a subsidiary of ASX listed Kentor Gold Ltd.
Geodynamics can acquire up to a 70 per cent interest. It can earn an initial 25 per cent following the completion of initial geophysical studies to determine locations for a drilling program. Stage One will cost Geodynamics $350,000 and should be completed before September 2013. Geodynamics will become operator of the project on completion of Stage One. Stage Two allows Geodynamics to earn another 45 per cent by spending $4.65 million for exploration drilling and completion of a feasibility study for a geothermal power plant. The island of Savo is 14 kilometres off the north coast of Guadalcanal and has a volcanic based geothermal resource. Preliminary exploration studies indicate there could be a substantial geothermal reservoir with temperatures over 260°C at depths of 500 to 1,500 metres. Honiara, capital city of the Solomon Islands, has a current maximum demand of 14 MW. Local electricity supply is high cost diesel with consumers paying among the worlds highest prices for power, currently around $0.80 per kWh. The project is said to have strong support from the local community, the Central Province Assembly and the Solomon Islands Government. Panax chairman, Greg Martyr, retired from the board at the conclusion of the companys annual general meeting, and was replaced by Stephen Evans. Papyrus Australia has received another US$50,000 as part of the non refundable deposit from the Egyptian Banana Fibre Company (EBFC) for machinery to establish a commercial banana fibre production factory in Egypt through Papyrus Egypt. Chairman Ted Byrt said directors welcome this progress toward EBFC fulfilling its commitment to the Papyrus Egypt joint venture and the procurement of patented machinery, equipment and know how from Papyrus Australia. The economic and political climate in Egypt, like many countries in that region, has been particularly tough in recent times and we have had to be patient with our Egyptian partners as they work through that environment to deliver the operating factory. The receipt of these funds is a clear indicator of their continued commitment, he said. Papyrus Egypt is obligated to buy $2 million worth of machinery and know how from Papyrus Australia to operate the factory and conduct business. The first tranche of the non refundable deposit of US$100,000 was received in October 2011. The balance now outstanding is US$350,000. To complete the purchase, EBFC will then be required to pay the outstanding balance of US$1.5 million. Advanced discussion continues with a funding provider in Egypt to assist with these additional funds to Papyrus Egypt, said Mr Byrt.